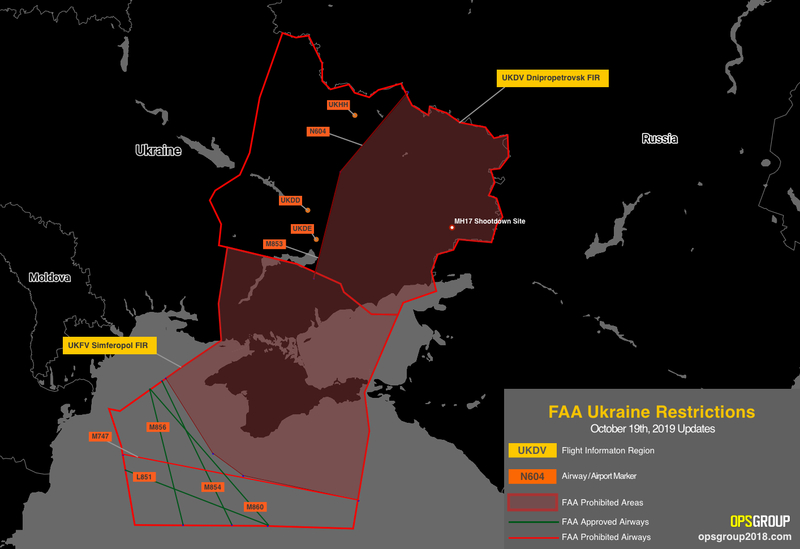 The U.S. FAA has partially lifted its airspace ban on Eastern Ukraine – the UKFV/Simferopol and UKDV/Dnipropetrovsk FIRs. The new ruling means that U.S. operators are now allowed to operate on routes over certain parts of the Black Sea, and to three Ukrainian airports: UKHH/Kharkiv, UKDD/Dnipropetrovsk and UKDE/Zaporizhzhia. According to the FAA, “security and safety conditions have sufficiently stabilized in certain regions of Ukraine, thereby reducing the area of hazard to U.S. civil aviation” in the UKFV and UKDV FIRs. click the image to open larger version! – Everything east of ABDAR – M853 – NIKAD – N604 – GOBUN is prohibited. Airways M853 and N604 are off-limits as well. – Operations to Kharkiv International Airport (UKHH), Dnipropetrovsk International Airport (UKDD), and Zaporizhzhia International Airport (UKDE) are now permitted. – Everything North/North East of SOBLO – DOLOT – SOROK – OTPOL is off-limits. – Airways M856, M854, M860 and L851 have been approved for flights over the Black Sea. – Airway M747 is prohibited, as it shares some of the off-limits airspace. The FAA’s previous ban, in place since April 2014, applied to all airspace in the UKFV and UKDV FIRs. There were two quite separate issues affecting the two chunks of airspace: risk from arms fire in the UKDV FIR, and disputed airspace in the UKFV FIR. The war in the Donbass region in eastern Ukraine resulted in the shoot-down of MH17 in July 2014. Multiple military aircraft were shot down in the region in the weeks leading up to that event. The airspace ban was imposed due to the clear risk of civil aircraft being targeted – or as the FAA puts it: “aircraft being misidentified and then intercepted or otherwise engaged”. The conflict has died-down, and only exists over in the east of the FIR anyway, near to the border with Russia. The risk to ops over the western part of the FIR is now sufficiently reduced so as to allow the reopening of that portion of airspace, and for flights to resume to the airports in that region (UKHH/Kharkiv, UKDD/Dnipropetrovsk and UKDE/Zaporizhzhia). In March 2014, Russia annexed Crimea. The ATC Center is in Simferopol, Crimea, and is now run by Russia. Russia claims the airspace, and now publish Notams for the FIR under the code “URFV”. Ukraine refuses to recognise the change, and asks crews to talk to Ukrainian controllers in Dnipro/Odesa ACC instead of Simferopol ACC. As the FAA point out, the risk here stems from aircraft “receiving confusing and conflicting air traffic control instructions from both Ukrainian and Russian ATC” when operating over the region. The Russians are still in Crimea, still claiming control of the airspace, and still confusing people. So that northern part of the FIR is therefore still out-of-bounds. But in the south, operators can safely fly over a handful of airways over the Black Sea which are controlled by Ukrainian ATC. What are other countries saying about Ukraine? Aside from the U.S., three other countries consistently publish airspace warnings: the UK, Germany, and France. UK and France: both have warnings in place advising against all ops over both of these Ukrainian FIRs, with the exception of airways L851, M856, M860, and M854 in the UKFV/Simferopol FIR. Germany: does not have any published warnings in place at all. So for the southerly UKFV/Simferopol FIR, the change to U.S. advice is basically just mirroring what France and the UK have been saying for the past two years. But for the northerly UKDV/Dnipropetrovsk FIR, the U.S. is now the first and only country to say that a portion of the airspace is now deemed safe to operate in. For more details on Ukraine and other airspace warnings, head to SafeAirspace.net. For the new U.S. rule in full, click here.